The blogs in the category “ArXiv Papers” titled “Whats new on arXiv” are based on (daily) publications of the arXiv server. Because there are a lot of different categories for the papers it makes sense to filter on specific categories relevant for our context. I am going through the resulting list of papers and choose the ones which are of general interest for a broader audience. For those papers the abstract is added, the rest of papers is just listed by title. What is the definition of Data Science? So the first thing I started to do is read as many posts on the topic as I could get my hands on and also lookup definitions of related topics such as Data Mining and Machine Learning. Looking at the discussions and posts around Data Science it seems to span everything needed to understand data, to derive something out of data and communicate the finding. This does not really help to answer the original question, so let´s take a closer look. The first 2 of them may appear similar at first glance, but actually they make totally different statements. 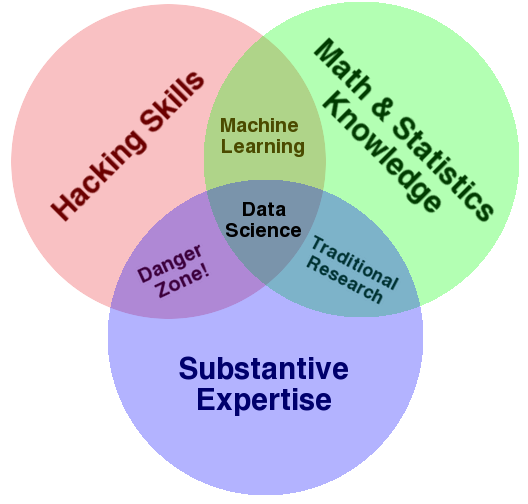 In the first one (Data Science Venn Diagram 2.0) for example, mathematics and statistics are a real subset of Data Science, whereas in the second one Data Science is a real subset of Mathematics, which is a completely different statement. Another question from the first one is, whether Data Science really covers all of computer science, mathematics and statistics etc. This does not sound reasonable. The third diagram tries to explain what exactly is meant by mathematics and statistics. It lists specific tasks, properties, questions etc. to specify the areas in the diagram. The most interesting question, what is Data Science, is only partially answered by listing some aspects which are assigned to it. A lot of questions cannot be answered. For example, to which region or set would one assign an algorithm found to predict earthquakes? Is it mathematics, IT skills, business skills, or traditional research? If you would like to see the current, but daily growing, detailed list of terms I collect you can have a look at it on http://advanceddataanalytics.net/what-is/ with a size of currently |What is …|>1600. 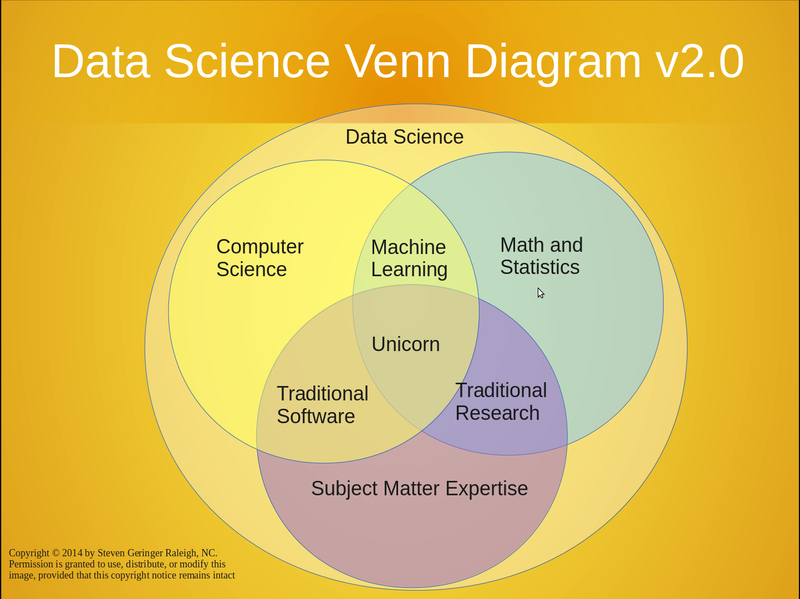 This should tell us that the Venn-Diagram-Approach is not really the way Data Science should be defined and these diagrams are not suitable for defining Data Science. Even the attempt to find an exact definition for it might not be reasonable. An example for this could be Artificial Intelligence. formulated in the language of mathematics. Matrix, table, graph, time series, CSV etc. findings from data and to implement and deploy the abstract concepts. R, Python, Julia, C++, Java, SQL etc. RStudio, GraphLab, DataBase, IMSL, BLAS etc. The difference to the above Venn diagrams is that we do not have sets representing areas, but icons representing aspects. One important aspect when we want to answer the question, how do I become a Data Scientist?, is the person who wants to become a Data Scientist. This person stands in the middle of all the concepts because this person has to combine the aspects to derive “findings”. Here you might note that I did not use the word Data Scientist, rather Data Analyst instead. The reason for this is, that due to my opinion a scientist produces abstract knowledge, whereas we are mainly talking about people using this kind of knowledge to produce findings which we also could call content. So the difference is in the kind of output you produce. 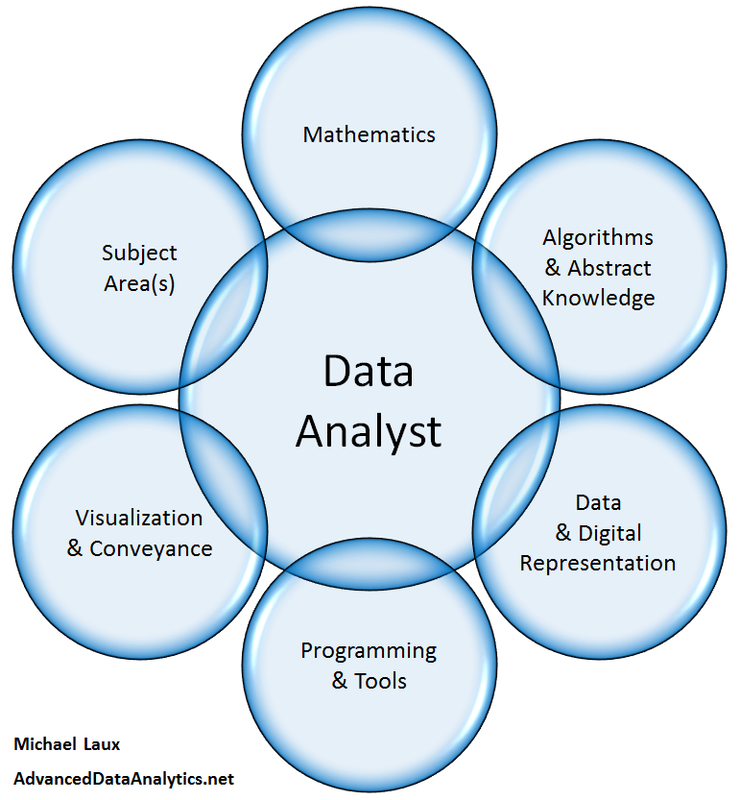 The overlapping regions could be interpreted as the knowledge of the person regarding the related aspect and the Data Analyst represents the need to combine the aspects. Take for example “Non-Negative Matrix Factorization (NMF)”: When you know about this algorithm, you might be able to formulate it mathematically and know about it from an abstract point of view. Next, it is important, to really comprehend what you can do with it. Means: Be able to formulate subject area problems also in an abstract way and be able to recognize if a specific problem can be solved using NMF, hence to map your abstract knowledge to your knowledge about the subject area and therefore to combine the aspects. If you then can lay down this knowledge andwrite a computer program and visualize the problem as well as the findings and then also communicate and document what you found / have done, then all aspects finally came together. This said, we can now come back to the original question, how do I become a Data Scientist? 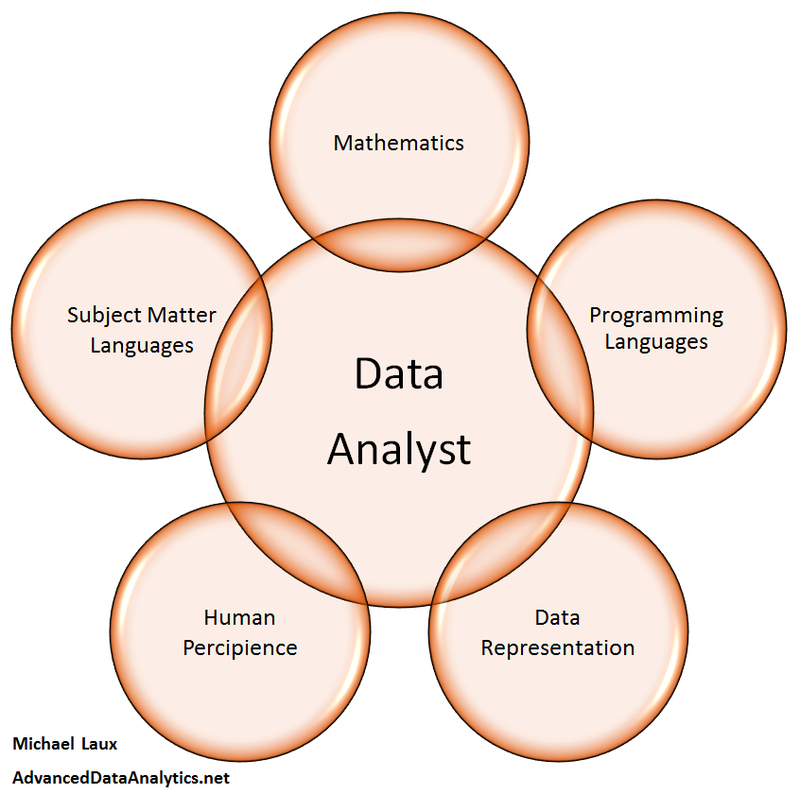 Instead I would like to ask the question, how do I become a Data Analyst? This depends on where you actually come from what is your coverage of the Data Analytics aspects in the diagram above or the main area of your expertise. This specifies the best way how to start the journey towards Data Science / Data Analytics. For example, if you are a Programmer, you have programming knowledge and knowledge about the aspect Data & Knowledge Representation. So you would ideally expand your knowledge in learning some new programming languages like R and Julia, for example by means of statistics and how they are related to data formats like graphs etc. and additionally by looking at tools discussed in the Data Science / Data Analytics communities. From there you might expand your knowledge into the area of algorithms using data analytics tools, programming languages and more until you cover enough data analytic aspects to put your hands on the solution of real data analytics issues and questions. You might start from a strong knowledge in a specific business area. Then you might try formulate your problems mathematically or to play around with illustration of your data and produce your own data visualization using programming. But…if it gets difficult, don’t hesitate to go into details. Again looking at the “Data Science Venn Diagram v2.0” where Data Science covers, for example all of mathematics, the question is, do I have to cover all of the programming languages, algorithms etc? Let´s take on another point of view and have a look at the question, what is software development? or how do I become a Software Developer? Are these questions easy to answer? When is somebody a Software Developer? When he can write code on a specific operating system and at least one programming language? What about knowledge about user interfaces, data bases, other programming languages, data formats like XML. When is somebody really a Software Developer? The question is not so easy to answer. Some people argue that if you do not have a strong knowledge of software development processes, product standards and guidelines they would not call you a Software Developer, but maybe a hacker. What we could say is, “The more knowledge one has on the different aspects of software development, all the more we would call him a Software Developer”. So if somebody knows how to write a Software Program in whatever language on whatever platform in whatever area, he might already be a Software Developer. We now could similarly think about Data Science or Data Analytics. There are people in Data Science who are specialized, for example in Retail Analytics; where they only need a subset of tools and concepts discussed around Data Science, but they are still Data Scientists. Then you could say that a Data Scientist is a person able to speak at least one language in each of these language areas and to be able to translate the dialects he knows into one another. We can now again come back to the original question, how do I become a Data Scientist? The above Data Analytics aspects just give you a guideline where you can start and what might be the next area to dive into, but it does not tell you actually what exactly to look at or to even get a notion of what could be looked at. For example, you might ask, what are exemplary keywords, books, feeds etc. related to Data Science to start with an investigation? What already exist out there related to Data Science aspects? Science, R, Data Analytics, Statistics etc. A list of “Illustrations” in the internet related to Data Science. referring to “Books” (Papers are listed on the Documents site). Webinars etc. with the intention to teach you about the related aspects. provide entry points for algorithms and to good explanations. A list of Data Science related journals. Resources for Data, Code Snippets, Programming Languages, Visualizations etc. A list of packages related to entries on other sites, e.g. With this at hand you should be able to find your path to become a Data Scientist. But there is still curiosity needed. If you, for example have to predict server downtimes you have to have at least a glimpse on available concepts, tools algorithms etc. to find entry points to answer your question. In this case maybe Survival Analysis, Time Series Analysis, Anomaly Detection, Outlier Detection etc.. Finally, because Data Analytics is crucial for the coming decades dominated by data, it is important that even those people who do not explicitly want to be Data Scientist have to understand the concepts. For example if you are confronted with the results of a neural network you should know, that you have to ask which training data has been used to train the model. Only then your company can become Data Analytics driven or data driven and stay competitive. Stay curious: Broaden your horizon.